Produced by Gene Simmons, associate producer; Pat Regan. Recorded and mixed by Dave Wittman. Recorded and Mixed at Rumbo Recorders, LA; Club Vital, LA; Right Track, Electric Lady, NY. 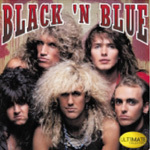 Black 'n Blue also recorded "Survival" (co written with Ted Nugent) and the Simmons/ Stanley song "It's My Life". Both tracks would not be used on the album.